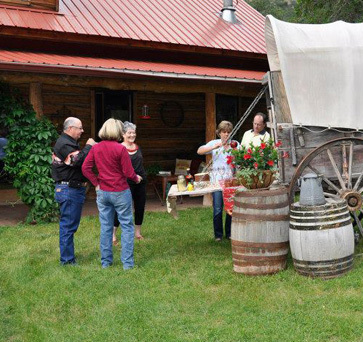 Dr. Robert and Joan Hamilton opened their ranch to a special dinner for 9 lucky guests on Saturday, June 13, 2015. Some of the Committee members (Laurel, Linda and Cindy) spent a wonderful day in the mountains on June 13, 2015. Our generous hosts, Dr. Robert and Joan Hamilton opened their ranch to a special dinner for 9 lucky guests on Saturday, June 13, 2015. The Hamiltons have 4,000 acres in the Wet Mountains just outside of Wetmore. Their first ranch was Babcock's Hole, where Charles Goodnight had a line camp and ran his cattle. It was also a favorite spot for wintering his cattle because of the prevalence of water. The Hamiltons then acquired the Farley Ranch and the Trinity Ranch. They are preservationists that have saved many of the 1850s log homes on their ranches and have found numerous boulders with etchings on them by the cowboys that were on the ranch. The group took a tour of the grounds, including the pavillion and log house bar. We visited with the peacocks, mules, watched the bison and listened to Rob's magnificent history of Charles Goodnight. We hoped to see the herd of Texas Longhorns, but the herd had taken off for parts unknown (maybe Florence?) and needed to be rounded up. I want to volunteer to help! Our chefs, Committee members Cindy Robinson and Linda Crawford, did the fixins' including the before dinner cocktails which included Sangria Wine and the Colonel's Cocktail made with Charles Goodnight Boubon and infused with jalapeno syrup and lemon, and great munchies. Dinner was served in the yard and guests were seated on old theatre chairs from the town of Victor. Joan's brisket and Cindy's ranch beans, garlic mashed potatoes, slaw, pickeled jalapenos, cornmeal muffins, bourbon bread pudding (Charlie's of course!) with ice cream and fresh fruit were offered at the buffet. The guests ended their evening sitting around the firepit enjoying dessert and the scenery, which included views of Pikes Peak. On the way out of the ranch, we visited with some bison that were hanging around the ranch road.